Born To Hack.!! 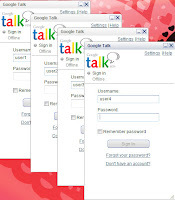 : Open as Many as Gtalks at a time .....!!! Right click on the desktop and make a shortcut. (3). Then click on the Next Button and give name googletalk.exe and click on finish. (4). Now whenever you will click on shortcut every time a new gtalk will open.